All is ok – let me just preface this story with that news. I woke up yesterday morning a little crampy. I haven’t experienced anything like this in 26 weeks – so I started to keep an eye on it. Looked like it was happening every 10 minutes. This is my third baby… so I knew I wasn’t contracting. My belly wasn’t hardening at all. But I felt OFF and in mild pain. On a scale of 1 to 10, I would say it was a 2. I called my doctor and she told me if I was still feeling the cramps by noon to head to the hospital. By 12:30 we were in the car. They would not go away. I was admitted and put on monitors. 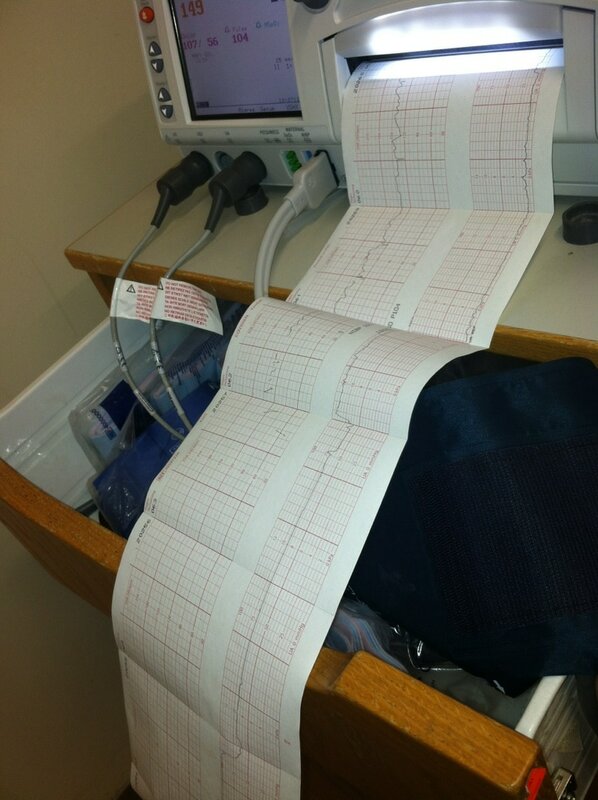 Baby was doing just fine and all those cramp were not registering on the monitor as contractions. 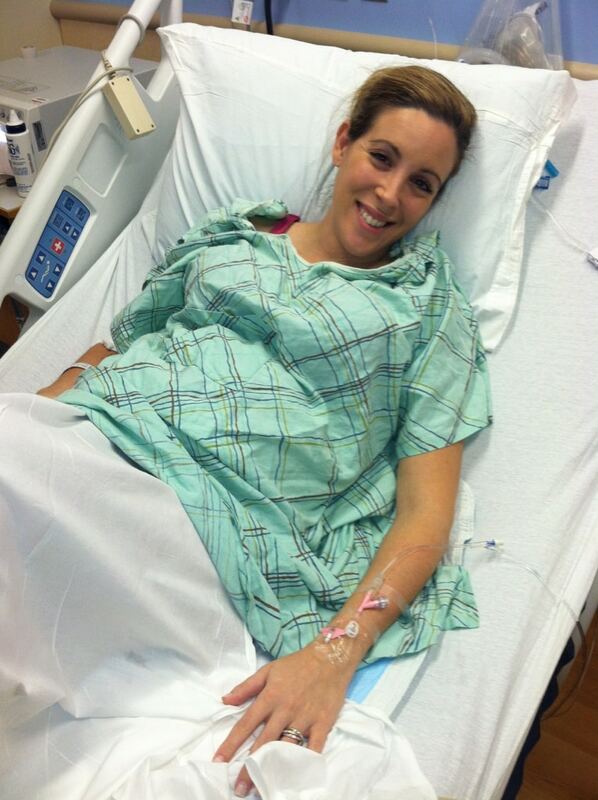 In fact, I only had 2 contractions in the 5+ hours that I was there which I absolutely felt. But even those were small. So, what could this be? Why such a consistent interval of pain? Every 10 min? It just was so odd. The nurses called my doctor to see if I was just a whiner (they didn’t tell me this but I know that’s what happened) and she told them that I never ever complain and to take me very seriously. After that call, they became much more attentive. I guess they get a lot of false alarms. As a joke I sent this picture to Audrey because she hates when I wear this shirt. She says I wear it way too much. So I made Bill snap this shot of me to tease her a bit. We had a good laugh – which I needed. But then they made me change and get an IV. They did a cervical exam and it went down quite a bit. I’m measuring at 1.4 right now which I am pretty positive is the lowest I’ve ever been with any pregnancy. I was given the steroid shot for this baby’s lungs just in case. I go back tonight for some more monitoring and for the second half of that shot. I’m also taking another FFN test to see if I’m at risk of delivering within the next 2 weeks. I’m scared because I don’t like that these pains I’m feeling are not registering on monitors. Makes me feel really insecure about it all. I woke up feeling the cramps again but now that they won’t show up on monitors. Thank GOODNESS I’m going tonight for more monitoring… because I would be sick to my stomach if I didn’t have that appt. I was talking to Bill and said maybe the cramping is from pressure on my intestine track? If it’s not my uterus – what could it be??? I just hate not understanding the pain, you know? Anyway, will keep you posted on tonight’s appt. Just think positive and breathe. I have 4 so I know how you feel. You will be just fine and the doctor’s know what they’re doing even though our hormones can get to everyone. LOL Have a great weekend and just take it easy. My thoughts are with you Vera! I hope this evening goes well and you are able to find some answers and comfort. Wishing you another long 14 weeks of healthy pregnancy and a beautiful healthy baby! For three weeks before my first baby I had crampy pains every 5 minutes on and off for several hours at a time. At one point the staff in ER said to come in. We waited for a few hours in the hospital and then I was sent home. When my baby did come it was such an easy delivery and she was there within 3 hours of when “real” labor started. Wishing you the best. Enjoy your blog. Sending prayers your way! Hang in there. 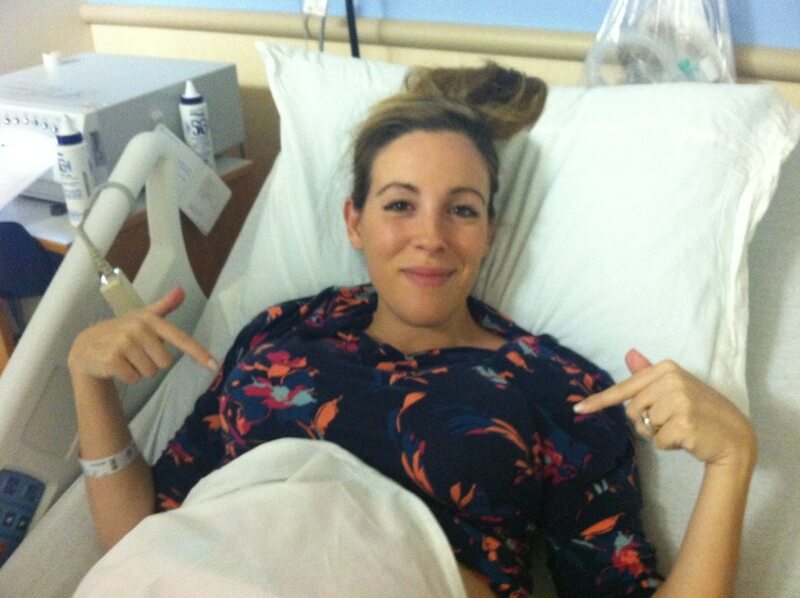 Hope you get answers soon and baby three is doing well! Sending warm, positive thoughts to you and your baby, Vera. Best wishes. Hope all was well when you went back in, Vera. Sending you my thoughts and prayers – and hugs. Thinking about you and hoping you feel better.